I have a lot of fat quarters, many of which I purchased a long time ago and have not used because I love the fabrics and don't want to cut them! My determination to use the fabrics from my stash as much as possible before I buy new fabric is forcing me to pull those favorite pieces out and (OMG!) bring the rotary cutter next to the ruler, all along thinking "I am going to regret this!". 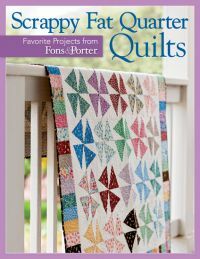 What a great pattern to use a lot of my precious fat quarters (Spin City is the name of the one in the book)! Scrappy Fat Quarters has beautiful designs, with plenty of diagrams and photographs to make the quilt making process very easy. I specially appreciate the "Sew Smart" boxes throughout the patterns with time-saving tips, and the "Sew Easy" technique explanations at the end of the book - two invaluable resources. I noticed Martingale is having a 40% off sale on many of their books through January 11, and 50% off calendars. So, after giving gifts to your friends and loved ones, here is a chance to get some for yourself (No, I do not make any money from your purchases, but when I hear of a sale I like to spread the word just in case some of you where shopping for the items!). 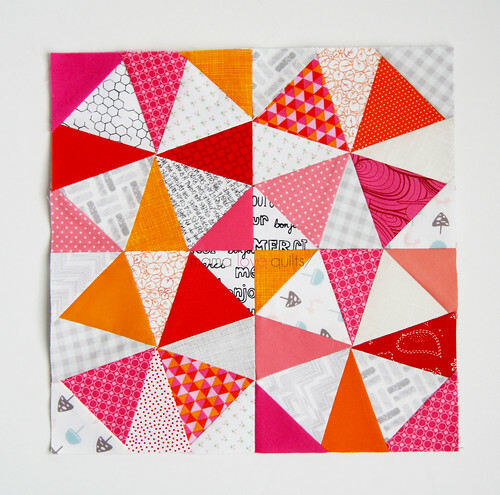 Thanks for featuring my block, Denise!